Students - Something interesting happened to me yesterday. Our family took a very long car trip from Western New York all the way to Washington DC. I had lots of time to look out of the car window, sometimes driving and sometimes not. And guess what? I was looking differently. Yesterday I really saw the roof lines of houses and barns, noticing their angles. I studied shadows that never would have noticed before. Why? Because I am drawing, and my seeing is changing. This always happens to me whenever I am writing regularly - everything becomes a writing idea. I took on this month's project to see if I could change my own eyes, slow down my looking. Three days have passed, and already I feel a bit of a shift, as if I am stretching muscles that have been sleeping for far too long. It is simply habit and time. Anyone can draw a teapot like this one or better than this one. (See the Mindset clip from April 1 if you don't believe me.) It just takes time to sit down down and really draw what your eyes see. Others are able to draw much more realistically than I am able to now, but I am pleased that this sitting is helping me become more aware. 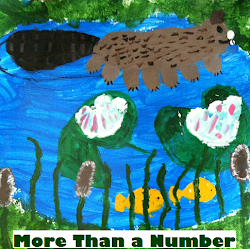 Today I am so happy to be back with another Poetry Peek! (See tab above for more such peeks.) It's been a while since we have had poetry visitors here, and visitor-days are my favorite days. So many warm welcomes and hugs to young poet Olivia and her friend, retired teacher Nancy March from Cumberland Maine, close to the ocean and only an hour from mountains and forest. Nancy taught fourth grade most of her twenty-five career at Yarmouth Elementary School, and today she is like a Pied Piper of Poetry - spreading the joy of words. This simple first memorization and conversation with my grandmother launched my love of poetry and nature. I would read Robert Frost, Carl Sandburg, and Emily Dickinson for hours. When I was 17, my grandmother died and I secretly began writing poetry as a way to stay connected to her. All my poems were written on scraps of paper I kept in a box. As my life unfolded it was nature that provided me with ideas for writing and Georgia Heard became my mentor. The invention of digital cameras opened a new world to capture the essence of my observations. Now, I am in a new stage of life – retirement. I miss sharing poetry and writing poetry with my students. 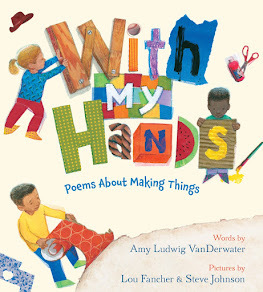 There is nothing like a new book of poetry or well loved poem or picture book to inspire new ideas and having kids experiment with words, nature, and art. Lucky for me I have an eight year old neighbor. Olivia, who loves to play with words. Every Monday we sit at the kitchen table and read and write poetry. 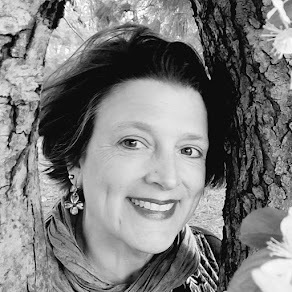 Let me introduce my poetry neighbor and friend – Olivia. I never had a writer’s notebook before, but I do now. I collect ideas, facts, photographs, illustrations, and new words. In the beginning I wrote stories and then I started reading and writing poems. I started writing poems from the freewrites in my notebook. 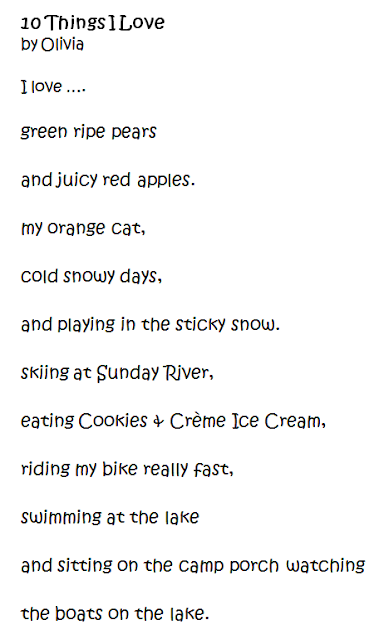 My first freewrite was about skiing with my brother and it became my first poem – Skiing with Owen. When I want to write a poem I think about things that have happened or I use photographs I’ve taken. Next, I make a list or do a freewrite. Once I’m done writing I start to organize my writing by taking some words away and maybe adding new words. I like to use describing words and alliteration to make my poems sound good. I like reading and writing poetry. Poems are like writing little stories. I like working on just the right words to make the poem perfect for me. 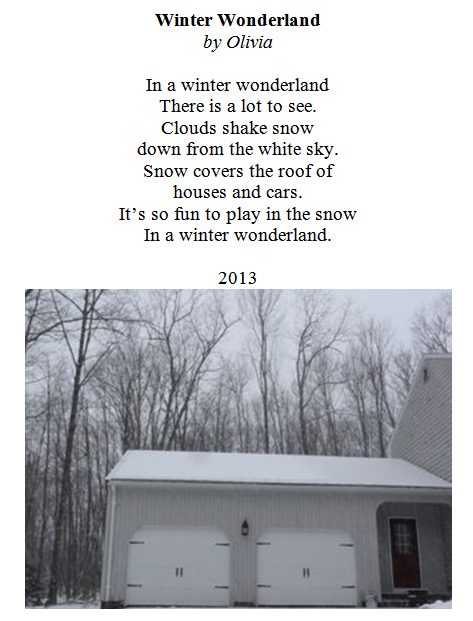 I also love illustrating my poems or using a photograph. I asked Nancy if she would be willing to share a teaching tip for sharing poetry with children, and she was. My purpose for working with my students is based on a philosophy I learned from Georgia Heard & Jennifer McDonough in their book A PLACE FOR WONDER. This book centers on the belief that all students should be part of an environment that inspires them to think, question, and discover. 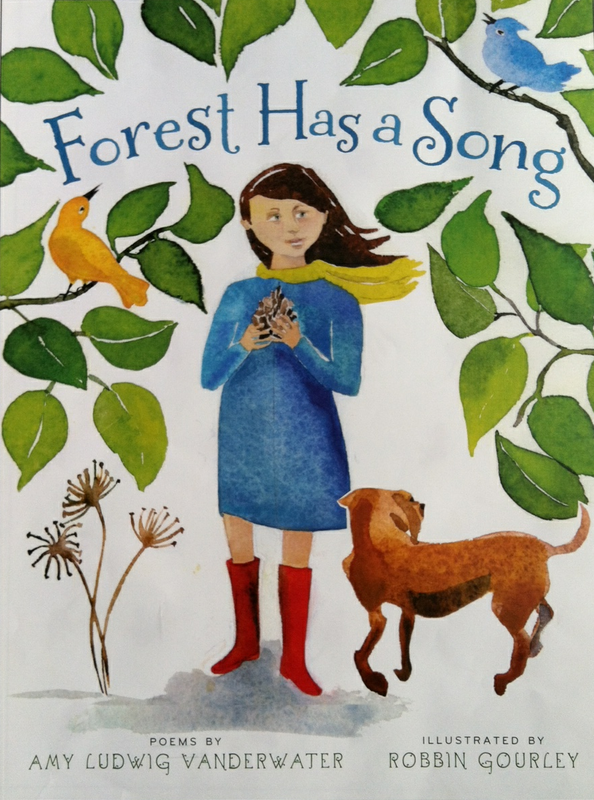 When I work with Olivia, I start each session with the same belief that "purposeful and authentic writing and reading come from children's own authentic and passionate wonders and observations about their world." 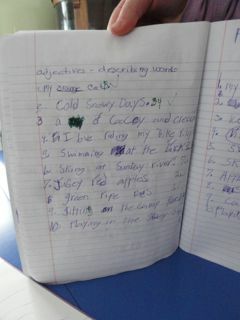 (page 5) Before we write poetry, we read lots of poetry and "look for craft in writing that we admire". Those words should sound familiar to all those who had opportunities to study the work of Donald Graves. It truly was 20 years ago when I heard Donald Graves talk about The Writer's Life and decided I wanted all my kids to have the experience of living that life. 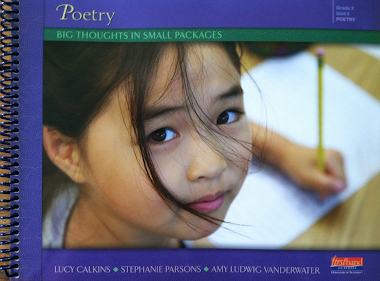 For each poem we write, we have a stack of poems that guide us through revision and help us build our poetry toolbox. Thank you so much to Nancy and Olivia for bringing a bit of their neighborhood to The Poem Farm! It has been lovely to have you here, and I wish you both a springtime full of poems. 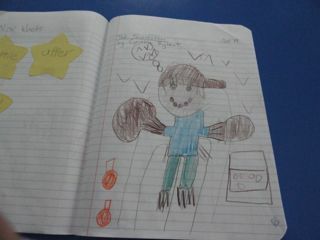 Olivia, Your poems are beautiful and I love your sketches in your writer's notebook! In 10 Things I love...I appreciated your descriptions of the snow and I can really relate to riding your bike really fast (I just got a new bike and rode it on Easter Sunday for the first time-there's definitely a poem in that ride)! You are very lucky to have a teacher/mentor right next door to you. It reminds me of when I grew up. I had 2 different houses I wen to almost daily-one was a retired teacher and she taught me Bible verses and states and capitals. The other was an elderly nurse caretaker and she taught me how to knit! I have written poems about both of them and I just bet you will write a poem about your neighbor someday! Keep on writing and you'll have a book just like Amy before you know it! Hi Amy. Great poetry post. St. Francis has always been one of my favorite. It is interesting to me that after 3 days, your viewing is shifting. I am very interested in 'seeing' where this project takes you. Thanks also for sharing Olivia's poetry! I went through a drawing phase, and I remember how my sight shifted to the shapes and the dark and light. 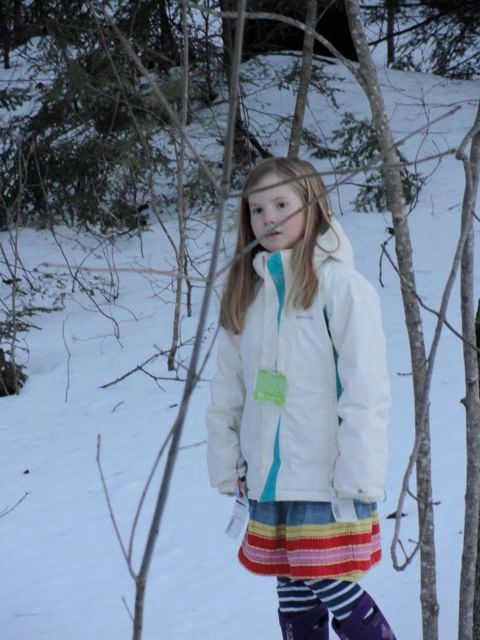 Olivia is a precious writer, savoring all things and sharing them with the world. Love that the clouds shake snow. Thanks for sharing. 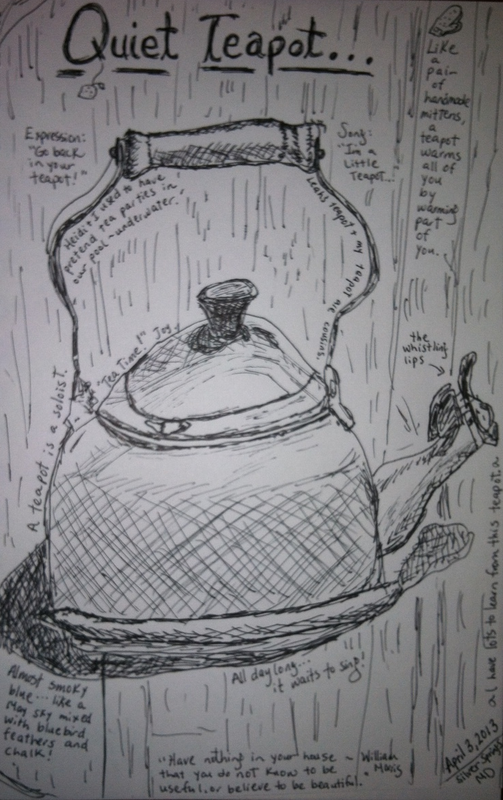 Oh Amy, your sketches are wonderful and poetry posts are pure bliss. Thank you for the smile this morning. I'm thinking of having tea with my grandmother so many years ago.